As R gets older, she is beginning to play imaginatively more and more. Open-ended activities such as these are perfect for stimulating imaginative play. Find out more about open-ended activities here. While she plays, she often recreates familiar scenes and sounds and is beginning to tell a story with her play. Other times, she enjoys pointing to and naming objects she has encountered before. I made a combined small world and sensory bin for R. It was made using a banker’s box turned on it’s side. I cut the lid off of the box and inserted it inside the box at its base. I then covered the surface with black construction paper and sprayed the paper with some Perfect Pearls mist. Included in the bin were a variety of glow in the dark stars and planets plus items from the Safari Ltd Space Toob. The filler for the bin was black beans and split chick peas. In addition to these items, I added small aluminum foil balls to represent meteors. To enhance the sensory experience, I played some space sounds from YouTube. a. 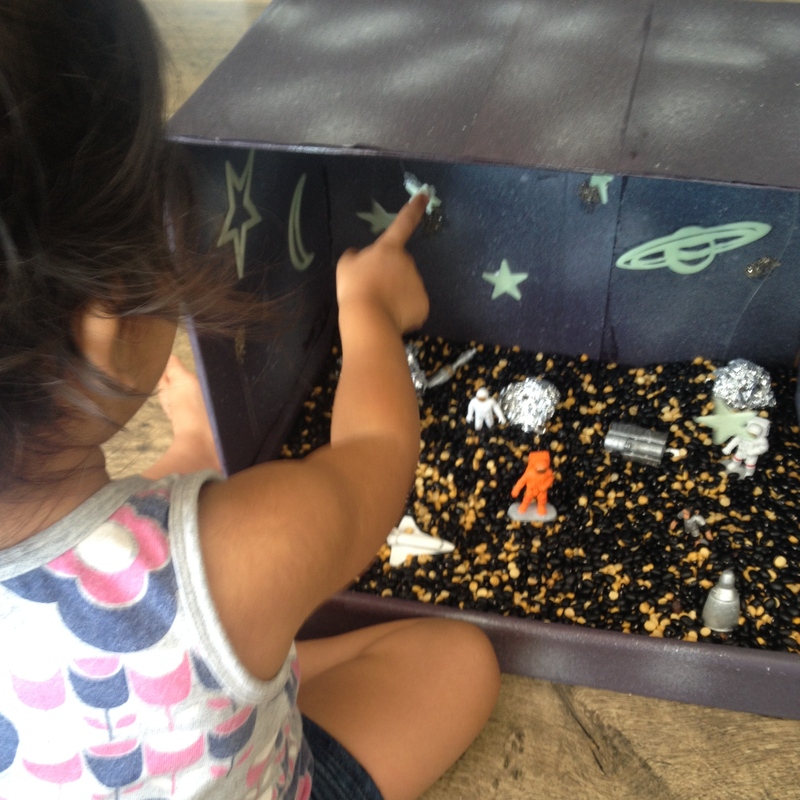 Encourage the child to come up with and perform a play using the materials in the small world sensory bin. The play can be videotaped and played back to the child so that s/he can enjoy his/her performance. I made a space scene using felt pieces I cut from a variety of colours. While I recited the poem mentioned at the beginning of this post, R made the rockets and alien spaceship fly around. She loved making sound effects with me and attempted to sing “Twinkle Twinkle Little Star”. a. Involve the child in the making of the felt pieces. 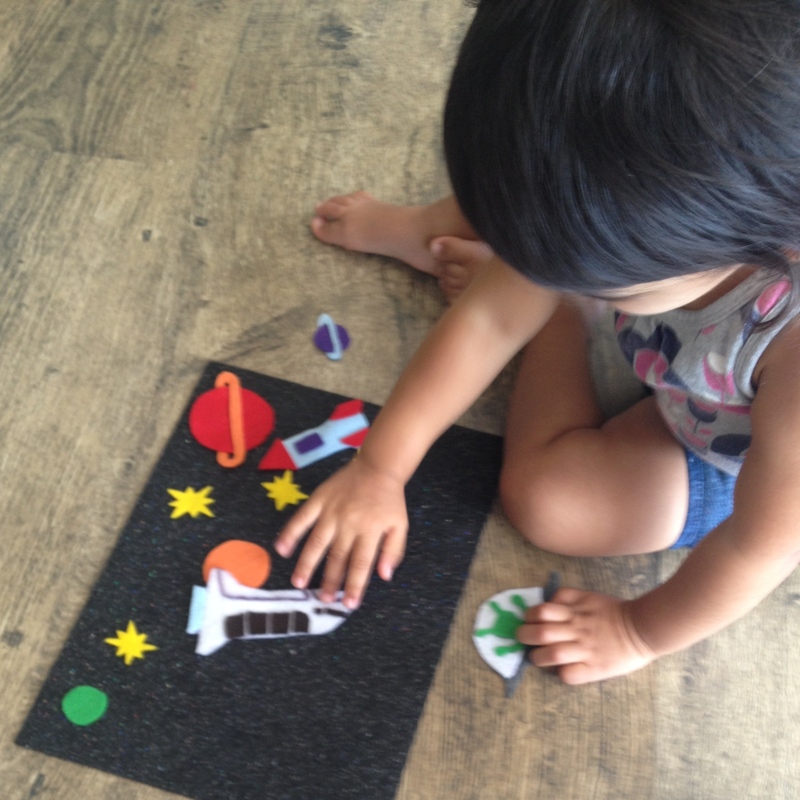 If s/he can’t use scissors yet, have him/her draw some space shapes on the felt using fabric markers and cut the shapes out for the child. b. Have the child use the felt scene as a story starter. Encourage the child to orally tell a story and then write the story in his/her journal. Today’s guest post comes from Liana, a mom I recently “met” on Instagram, who has 2 year old twins! You can see her original post here. Liana mentions that they are a foodie family and enjoy eating healthy food. The way she encourages her kids to develop healthy eating habits is by making creative meals and snacks for them. 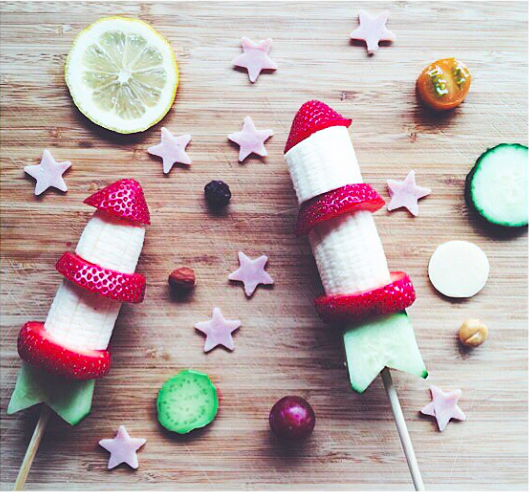 She says, “food is better when it’s fun, colourful and festive!” Included in this snack are a variety of fruits, vegetables, meat and cheese! a. Kitchen helpers. Invite the children to be a part of the food preparing process, and they are sure to enjoy the meal even more!